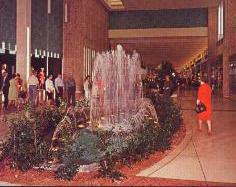 The Lloyd Center is still around today--ice rink and all. 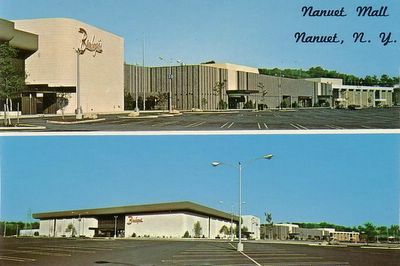 Visit their current site here. 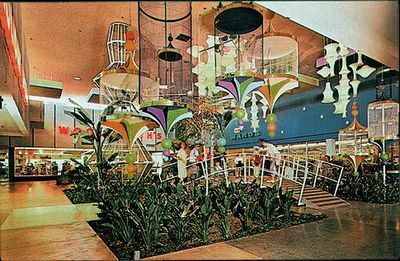 Some wild psychedelic colors here, and a really ambitious (and busy) lighting array! 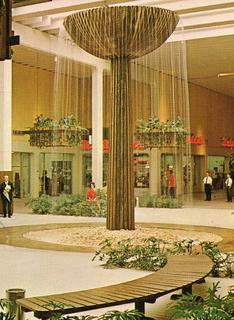 I would've loved to have seen this baby lit up in the evening. Bet it was sweet. Sadly, this colorful mall is no more. Like so many others, it's now a strip mall. According to info on the web, it had been extensively remodeled in the 1980s, so the incredible view you see here, was probably gone after that (if not before). 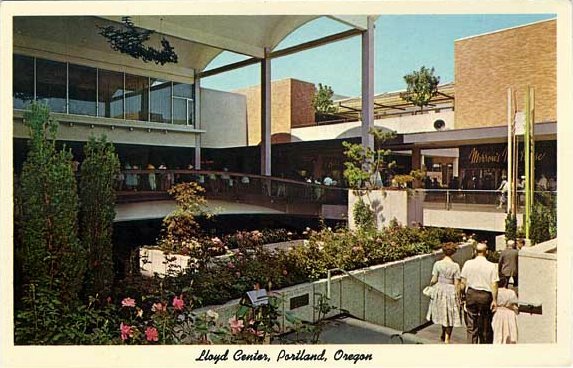 When it opened in 1964, officials boasted that it was the first fully enclosed mall in the state "where you can stroll from one store to another without touching a door--or even seeing one." 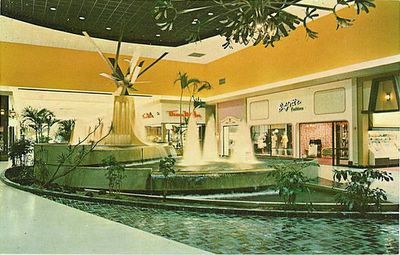 Malls of America on TV! If anyone would like to see the segment (all 30 seconds of it), it will air again next on July 3rd @11am on G4. Thanks to everyone out there who have been passing this blog around (you know who you are). I really appreciate it! Let's continue to hang out here together, in the internet's first climate-controlled, air-conditioned blog! It's a great way to beat the summer heat! 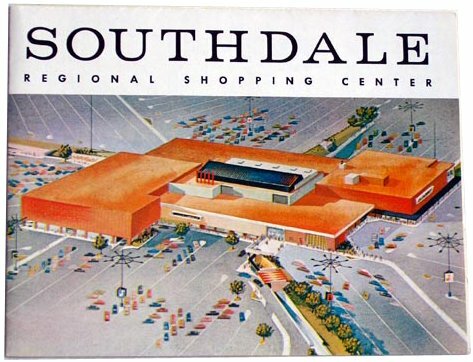 Why shop anywhere else when the sales are a-poppin' right here! Welcome to the Jet Age! I really like the bright, "modern", open-air feeling of this shot. 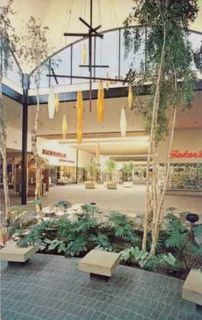 The creamy earth tones, mixed with those wonderful colored hanging light fixtures and the complimenting birch trees (or whatever they are), really give this mall court an elegant look. 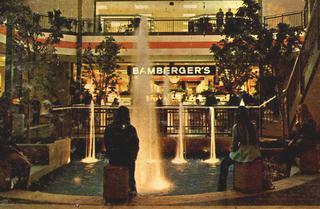 Note the cool gold chalice-style fountain anchored there in the middle behind the trees, too. Nice. 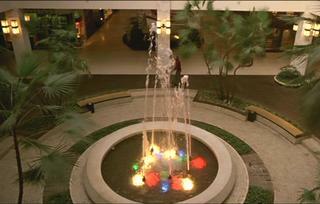 Here's a closer look from another angle, of the garden and neat-o light fixtures. 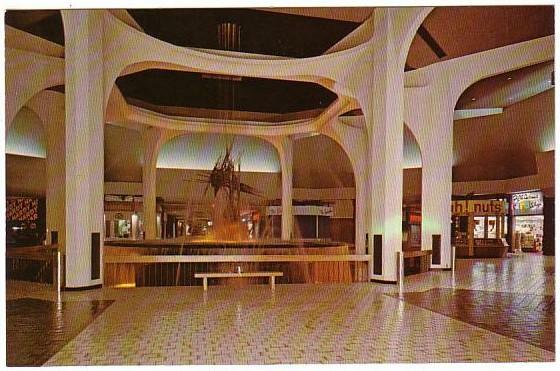 This photo via. Man, isn't she a beauty! Nice clean look and layout. 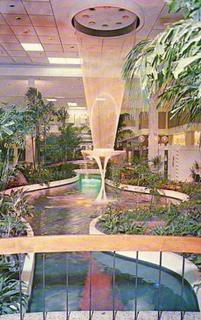 Love the hanging plants on the upper floor... and that fountain! Wow. 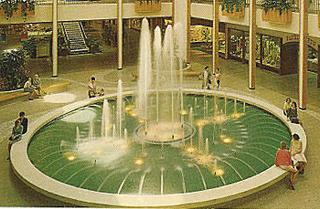 Now that is a great fountain! ...and Kottke.org-ed (among several others), so that, coupled with the weekend and all, put me behind on the comments here and my sudden influx of e-mail the past couple of days. 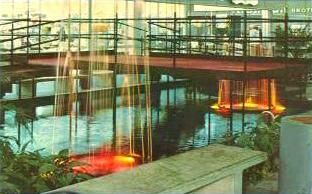 So many new visitors with wonderful post comments that I needed to respond to just now. At least I'm caught up with that part of it. PS: If anyone can help identify this mall, I'd be much obliged (and I'd really like you). Update: Thanks for identifying this one, Crashlog! The next soft pretzel and coke is on me. Just look at that second shot. 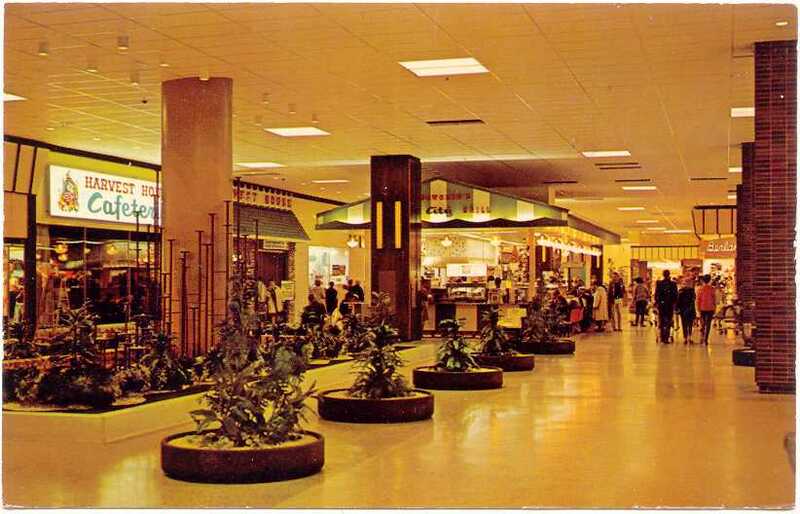 What a beautiful, butterscotchy dream of a vintage interior! In my mind I am so there...here! Remember these? 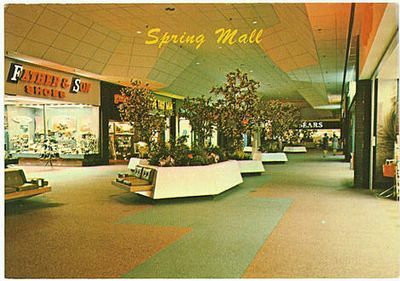 Many shopping malls in the '60s and '70s had a really fun tradition of housing indoor Aviaries (as well as monkey cages, fish tanks, and the like), so busy shoppers and rambunctious kids could take a break and watch the cute little animals do their things--which was generally to sit really still and stare back in total boredom. 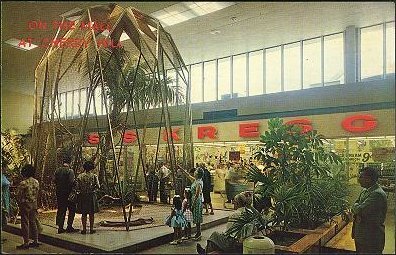 But hey, to us kids these were truly magical things, these mall cages! 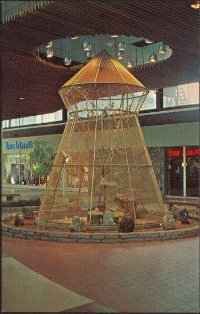 I know no trip to Universal City Mall in Warren, Michigan (my local "homebase" mall in the 1970's) was complete without a quick stop by the huge old bird cage near the main (West) entrance. 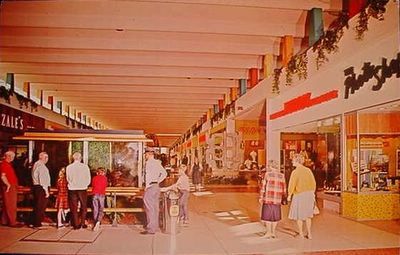 I remember feeding the birds popcorn and stuff, too, when we had some. Most animal cages are long-gone from today's malls, though I've heard that a few around the country still carry on the tradition. Good for them, I say! 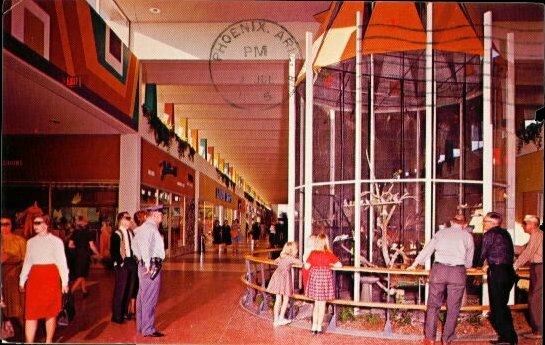 Aviary in Cherry Hill Mall, in New Jersey, circa 1960's. 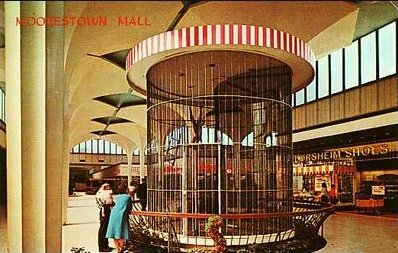 Thomas Mall monkey cage in the '60s. 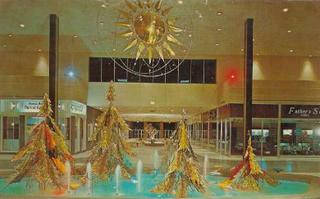 Phoenix Arizona. 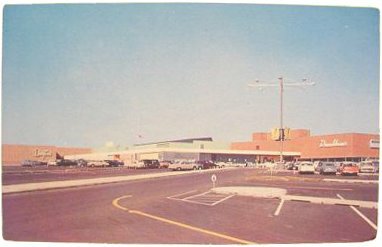 Chris-Town Shopping Center bird cage court in 1964. 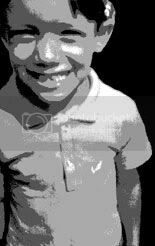 A pop art masterpiece now! 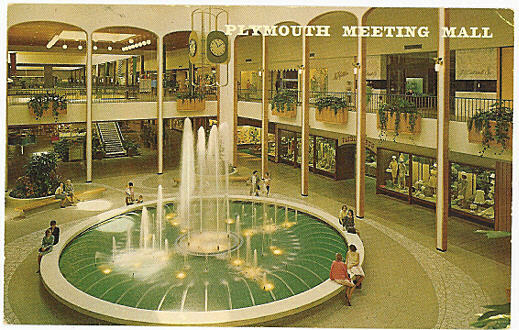 This is one of my favorite vintage mall photos. Like something out of A CLOCKWORK ORANGE! 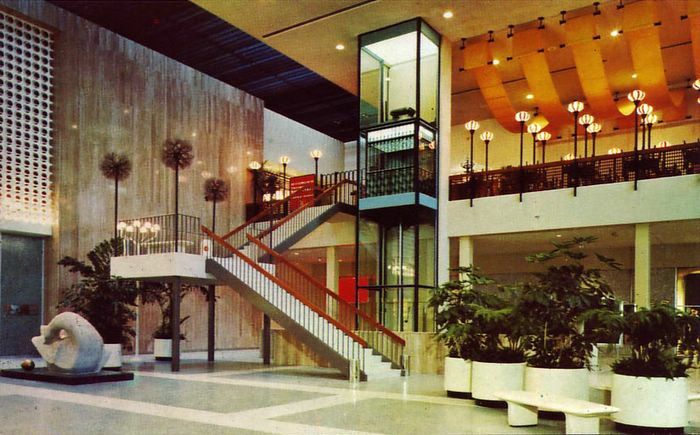 Man, if I could only live in a house like this... I'd never leave the house. 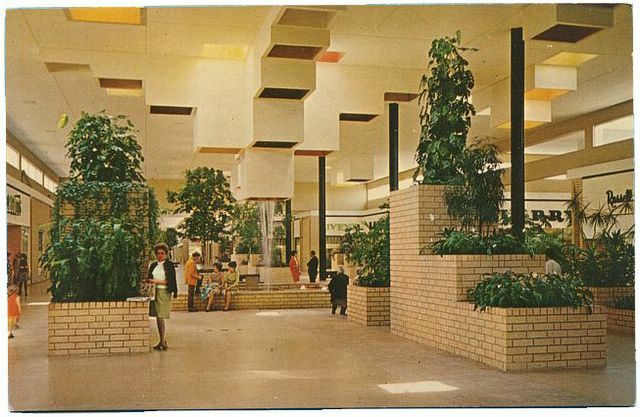 Looks like the "tetris" motif. This colorful photo really captures the tacky '60s mall vibe! 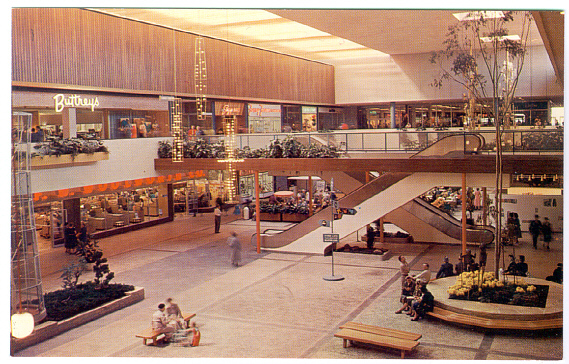 A lot of shopping malls still looked like this in the '70s, too. For some reason, I just love the inside of this mall--sparse and pukey-colored as it may look! To me it's a thing of pure beauty. 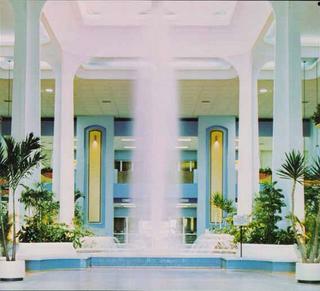 Wish I were there right now, the day this photo was taken. 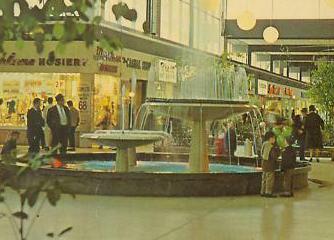 '60s or '70s. 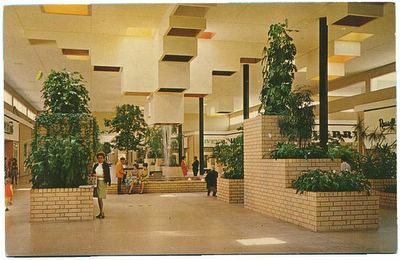 Unknown mall interior. I do see a Ben Franklin store over there, though! 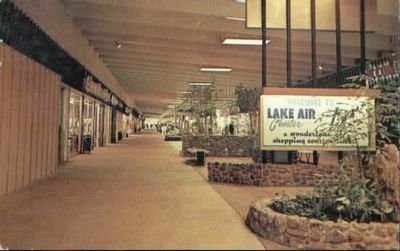 Loved those. 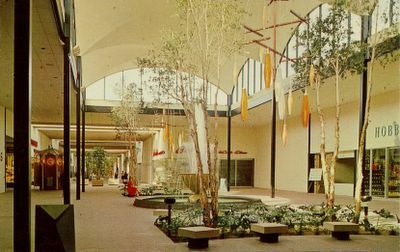 Gorgeous shot of the Carson, Pirie, Scott and Company department store in the Randhurst Shopping Center in Mount Prospect, Illinois. I just love the multi-colored lighting along the outside! 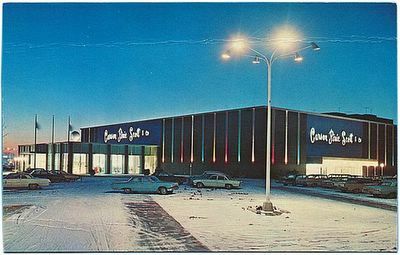 Bet it was warm and toasty in there on this cold 1960's winter night. 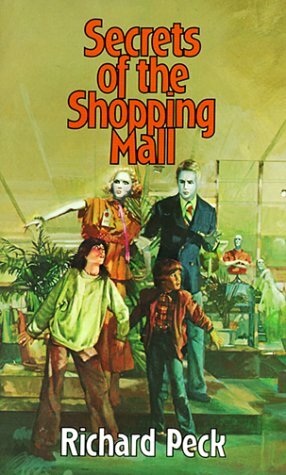 Greetings fellow members of the consumer society, and welcome to the experiment that is, MALLS OF AMERICA! 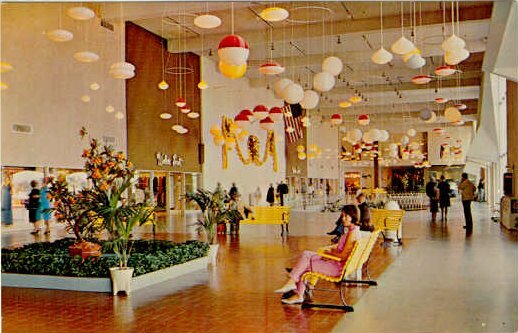 A celebration of vintage shopping malls of the '60s and '70s, through pictures, words (a few anyway,) and maybe the occasional sound, too (you'll see). As a suburban kid growing up in Madison Heights, Michigan, in the 1970's, I certainly saw the insides of our local shopping malls a lot in those days. 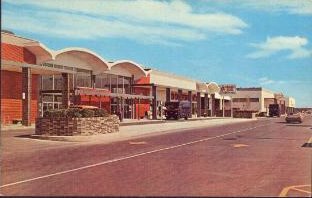 My family, relatives, and friends all practically lived there, and it was truly a part of the very fabric of life for us back then. Consequently, I now look back very fondly on those days of my youth, being dragged around those cavernous shopping malls and department stores by Mom and Dad, gazing in wonder at all the colorful delights that passed before my young eyes like a dream. 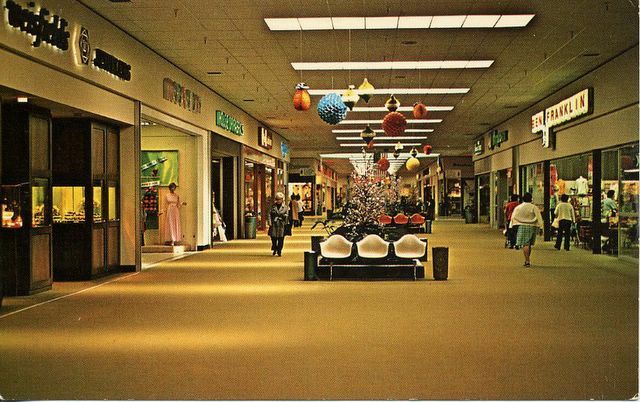 It really was like a literal wonderland to my brothers and I! 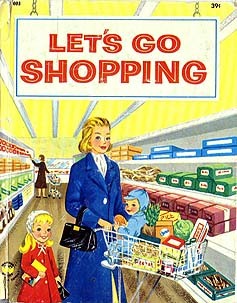 And those are now some of my favorite family memories from childhood. Nowadays, most of those great old shopping malls are either closed altogether, or at the least, updated and modernized to the point of losing almost all of the charm and character they once had years ago. 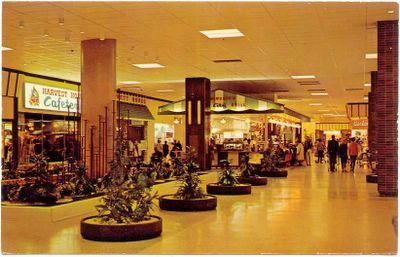 Shopping malls of the '60s and '70s had an incredible vibe and excitement that they just don't have anymore. And I really miss it. The way they used to be. 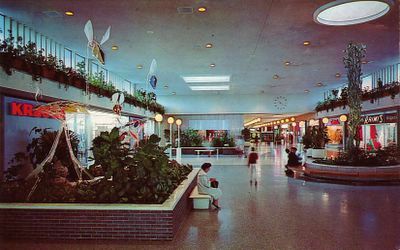 I promise, if you'll just spend some quality time with each photo, and truly enter its space in your imagination, and hear the Muzak; you'll be transported back to a wonderful, magical time and place, when life, and the world, was much simpler, and malls a whole lot cooler! A word of warning, though... Like me, you may not want to return.